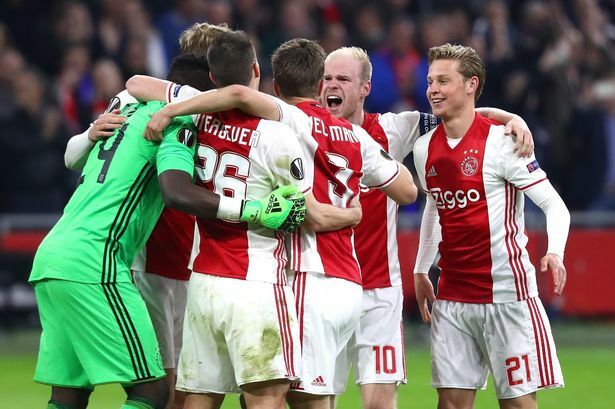 Ajax are coming off a disappointing season in the Dutch Eredivisie, as they could not win the league title. However, the Dutch powerhouse will have a shot at redemption this Wednesday. With only one game left in the UEFA Europa League, they know a win against Manchester United would give them the glory they have been looking for quite a while. The game will be played on Wednesday, at 19:45 hrs. Ajax will near full strength for this pivotal game. With the sole exception of Nick Viergever – who was sent off against Olympique Lyon in the semifinals – Peter Bosz will have the majority of his squad available against The Red Devils. In terms of injury absences, Lasse Schöne is doubtful and will require a late-fitness to determine his availability. Daley Sinkgraven is reportedly back in training following a knee injury, but he has been ruled out due to a lack of match fitness. The Soccer News has prepared a probable starting XI for Ajax in this game. The average squad of the side will be 22 years old. All good teams in the world have a competent goalkeeper, and Ajax are not the exception to the rule. Andre Onana will remain between the posts, as it has been the case during the entire Europa League campaign. The 21-year-old Cameroonian goalkeeper conceded three goals during the second leg against Lyon, so he will need to be at his best to stop Manchester United’s attacking line. In front of Onana, Bosz will deploy his usual four-men defensive line. Davinson Sanchez and Matthijs de Ligt will play at centre back, while Joël Veltman and Jairo Riedewald will handle the flanks. Riedewald will have a big chance to shine due to Viergever’s absence. However, he will have a tough task against more experienced players such as Henrikh Mkhitaryan and Jesse Lingard. Another player to keep an eye on is Sanchez. FC Barcelona have been looking to sign him, and a good performance against United would increase his value. Bosz is not going to change his approach, so we are likely to see three central midfielders. As mentioned above, Schöne is doubtful but likely to start, and he will play alongside two creative players such as Hakim Ziyech and Davy Klaassen. All three players are capable of contributing on both ends of the pitch, but there is no question the biggest star in this group is Ziyech. The 24-year-old playmaker often takes a seat back to Klaassen, but the numbers speak for themselves. The Moroccan has contributed with two goals and four assists in 12 Europa League matches. His creativity in the final third will be key to unsettle Manchester United’s combative midfield. The attacking trio is not likely to change in this game. Therefore, Bertrand Traoré, Kasper Dolberg, and Amin Younes will likely slot upfront. All three have interesting things on their game, and there is no question they have enough talent to complicate United’s defensive line that will not have established starters such as Marcos Rojo and Eric Bailly. Traore was one of the main reasons why Ajax reached the final, since he scored two goals in the semifinals against Lyon. Dolberg is the team’s top scorer in the Europa League with six goals in 12 matches (nine starts). And Younes has been impressive this season, to the point he will represent Germany in the 2017 Confederations Cup. Between all three, they have 12 goals and six assists in the Europa League. Intl Champions Cup: PSG vs Juventus – Tickets Available!